Practical and informative online workshop to help businesses take advantage of the power of social media as a way to market their business. • Want to use Social Media strategically in your business? • Trying to determine what social networks to be on? • Having trouble keeping up with the latest social media marketing updates and best practices? can be used by your business to grow leads and sales will be outlined to attendees! Social Media is different than traditional marketing. Learn about the methods for Attraction, Engagement, Lead Capture, Conversion, and more. The workshop, presented by, Mike Gingerich, and available live online or by replay after will help entrepreneurs, small businesses and marketing teams from larger businesses understand how they can use the latest tools and updates in social media as part of their overall integrated marketing plan to increase their website traffic, reach new customers, and nurture new leads to become clients. This is a entry to intermediate level workshop. What social networks should our business focus on? How can we not just spend time, but gain real leads via social media? What trends for 2017 in social media do we need to be aware of? How do we use Facebook Live Video, Instagram Stories, & Facebook Ads? How does social media fit into our overall marketing plan? How do I capture leads from social media? A question and answer time will be included after the initial 60 minute presentation for an additional 15 minutes to answer further specific questions. Each participant will leave with actionable steps to help guide them in next steps they can take to improve their use of social media for their business. 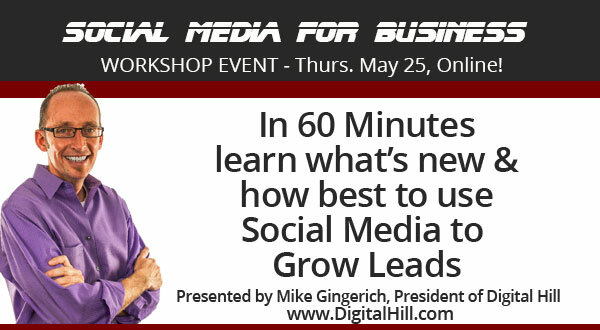 Mike offers no-nonsense, straight talk on growing leads and leverage with social media and digital marketing to help small and medium-sized businesses elevate their game and win online. Mike is President of Digital Hill Multimedia, a web development & marketing agency, co-founder of TabSite.com, a leading Facebook Page app service for contests, and Waftio, a website lead capture tool. 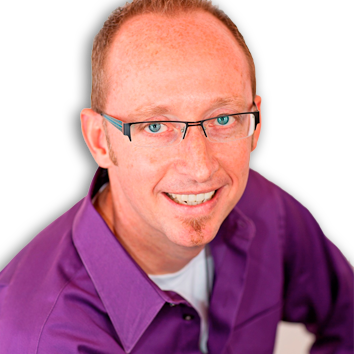 He is a noted Facebook Marketing speaker, as well as author of the book, Game Plan for Social Media Lead Generation. Mike’s passion is to see businesses and people grow into their highest potential. Mike has the unique ability to dive deep quickly, understanding businesses, social networks and trends, while delivering energetic and practical ideas marketers can understand. Mike has 10+ years experience in Internet Marketing, a Master’s in Organizational Development and Leadership, and a proven track record of providing innovative digital and social strategy consulting for businesses.